I lost my dad when I was eighteen. I’m not going to lie, up until that point my life was pretty easy. I was loved by two amazing parents who wanted nothing but the best for me, and was always taken care of. I was well-fed and healthy, had a great education, got to travel often, and wanted for nothing. The only unhappy memories I have stem from my own idiotic behaviors in high school – I was a teenager. Sue me. But those were few and far between. But truly, I had a wonderful childhood and always felt supported, loved and cared for. I was quite sheltered and unexperienced, especially when it came to big life moments like the one I was about to get rocked by. Before I tell you what happened, I want to tell you a little bit about my dad. He was larger than life, and there’s not a person I’ve met who knew him who disagrees. He lived every moment to the fullest – loved A LOT, worked hard, had unshakable faith, was always making new friends, and just truly gave everything he had to whatever was in front of him. 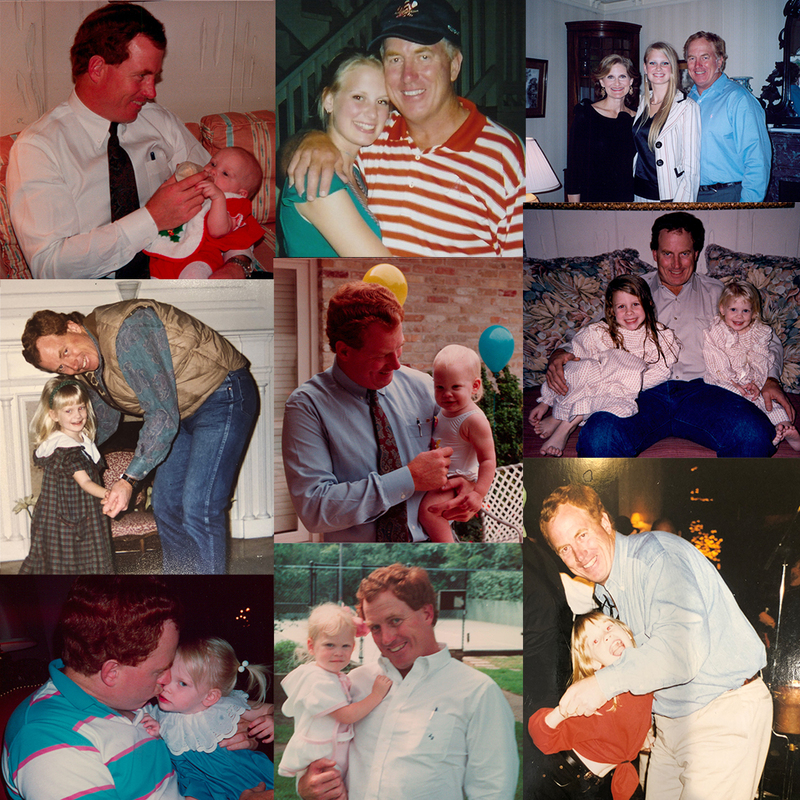 To this day, people I’ve never even met come up to me and tell me how much they loved my dad – whether they worked with him in some capacity, met him at a random party or went to grade school with him, everything I’ve heard focuses on how wonderful he was or how he helped those people with something. When you spoke to him, he made you feel you were the only person in the room. Everyone was his best friend, and he was always trying to help others. I know this may sound biased coming from his daughter, but I swear, it is not. He was known as Big Red in our group of family friends, and everyone’s favorite phrase of his was “That’s what I’m talking about!”… and nobody said it like him. It was during my freshman year at SMU. I had just pledged a sorority a few months before and was having the time of my life! I had awesome friends, was loving school and everything was great at home too. My dad had just celebrated his 50th birthday with all of our close family friends at a ranch he and my mom were renovating the weekend before Easter. He would have been 62 on April 10th this week. It was Good Friday, and I was driving down to Austin with a friend for the holiday weekend. I remember when I got the call so clearly, because I had just dropped her off at a friend’s apartment at UT and was driving the short distance to my old house on Windsor Road. It was my sister on the phone, and she called to tell me Dad was in an accident. My first instinct was to react with anger at her, because I assumed she was playing some kind of a mean joke – I’m pretty sure I cursed at her, but I rushed home none the less. When I got to my house there were cars everywhere, so I knew it was bad. I walked in the house to find a bunch of our family friends waiting for me (along with my sister and her boyfriend at the time). My mom had already left in a panic for the hospital with my grandparents, so my sister’s boyfriend drove us down there. All we knew was that he had been in an accident – we had no idea of the extent of his injuries or any of the details. It took awhile to get to the hospital, because he wasn’t actually in Austin. He was taken to Brook Army Medical Center in San Antonio, which I later realized was because they have a special burn care unit. When we got there, we were brought to a waiting room and told what happened. He was at a YPO event in Fredricksburg, and he had gotten on a helicopter with some of the other attendees to fly over to another property for another part of the event. Most of the attendees drove, but my dad was adventurous. Just after take-off, the helicopter clipped a power line and crashed. We hadn’t yet gone into see him, so I was still in the “I don’t believe it” state of mind. Even after getting all of the details and being in the hospital, I didn’t believe it. I literally could not process it, and even months later I had trouble digesting that this all actually happened. Every once in awhile I’ll wake and up and wonder if it was all a bad dream, but then reality hits me. I don’t remember much about the waiting room, except for there being a lot of idle time – at one point I even started doing crunches on the floor to distract myself (don’t ask me why – shock is a weird thing). We sat there for awhile – I don’t remember how much time had passed before they came and brought us to see him. Again, I don’t really remember the sequence of events here, but I’m pretty sure at that point we knew he wasn’t going to make it. I remember them telling us he had 3rd degree burns over 98% of his body, with his feet being really the only place not injured… they were protected by his boots somehow. So when we went in the room we were allowed to hold/touch his feet. There are a lot of fuzzy memories about this weekend, but that I remember clearly. He was on a respirator, covered in dressings and definitely didn’t look like my dad. I couldn’t take it, so I left the room. My mom and sister stayed in the room with him for awhile, before they came back out to talk with the doctors and the rest of us in the waiting room. After that, it’s like my sister and I switched places – she then said she couldn’t go back in there, and I just knew I had to. I went back in with my mom when they took him off the respirator. It’s almost as if a light went on in my brain that told me I had to step up and be there, for that and all things following. Subconsciously, I knew I needed to be strong for everyone else. That was the last time I cried for a really long time. The funeral was a few days later at Tarrytown United Methodist Church, the church we’d been going to since I was a toddler. It was the first time I realized my dad had touched so many people’s lives – hundreds of people came. The sanctuary hit capacity, so the church had to open up other fellowship areas and play the funeral on TV’s on those rooms for people to watch. I mean, I knew he was a well-known business man and philanthropist in Austin, but there were so many people – many I had never met or even heard of. It was incredible. Following the funeral, there was a reception at our house – some of my friends drove in and I remember being so excited to see them. Again, sort of the wrong emotional response – like I said, shock is a weird thing. I think I stayed home for another week with my mom and sister, but then after that I went back to school and life went back to normal. While my mom was truly grieving and my sister was dealing with the loss in a different way, I just acted as if everything was fine and went back to my everyday routine at school. It wasn’t until I started dating my college boyfriend several months later that the grief started hitting me like a mack truck. I was always fine when I was sober, but the second I had some alcohol in me all the flood gates opened and I would just sob uncontrollably. Looking back, I feel pretty bad for my then-boyfriend that he had to deal with that – but he was great about it. There was just something in me that wouldn’t let me fall apart, but the second my inhibitions were lowered, all bets were off. I couldn’t control it. I’d act totally fine during the day, but then call my mom in tears in the middle of the night. Everyone grieves differently, but the five stages of grief ring true. I think I was stuck in the denial stage for the better part of a year before the anger hit… which was when the tears started flowing. After a couple of months of telling myself I could handle it on my own, my mom convinced me to go see a therapist to talk it out. If you are struggling with grief (or anything!!! ), I highly recommend it. It’s so helpful to be able to talk with someone who has no bias or connection to you – they will give you honest feedback and help you come to terms with what you are struggling with. While I don’t have any big tips to help you get through your own loss, I would say that it’s better to let the grief in than try to shove it out of your mind. It’s going to come out eventually, and the earlier you can face it the better. With that said, there is no timeline to grief – just be patient with yourself. It’s been exactly twelve years now since I lost my dad – he died on April 14th, 2006. This many years later the pain is still there, but it hurts a little less with each year that passes. There are still a few things I struggle with that I think many can relate to. There are life events I wish he could’ve been here for (and future ones too), I wish he was here to give me advice in all aspects of my life, and that kind of thing. But mostly I just miss his big personality, giving heart and support as the amazing father and person he was. I miss him every day. For better or for worse, I believe this catastrophic event at eighteen shaped who I am today. The part of me who is a control freak definitely stems from that, and can you blame me? My reluctance to be emotional and vulnerable stems from a need to be strong for other people. Death is a part of life, and unfortunately everyone will experience grief at some point. The one thing I hold onto is that I know he is in a better place, is watching over me and my family, and I will see him again. God’s got the most incredible, red-headed angel up there! Oh my goodness. My heart aches for you and your family. Thank you for sharing your story. I’m so sorry for your loss Merritt, this is a terrible thing to go through at 18. But I’m 100 percent sure your dad is so proud of you. Thank you for sharing this. I lost my dad as well, I understand so much of what you wrote here. Your dad sounds like he was a wonderful person. I’m so sorry for your loss. I’m sorry for your loss as well – I’m glad to hear you could relate to my post, even on such a sad topic. Thank you for reading! Thank you for sharing this. I remember hearing that your dad died when we lived in Boaz Hall. I couldn’t imagine the pain. My dad died unexpectedly almost exactly one year ago, and I am not doing well. I’ve been dealing with it much the same as you did. It helps me feel validated to know that you had a hard time confronting the grief early, as well. I guess somehow we can all get through it. Carleigh!! Thank you for reaching out – I’m so sorry to hear about your dad. I know nothing I can (or anyone can) say will make you feel better, but take it one day at a time. Talk to people and be honest with yourself about how you’re grieving. You will get through it, but it will take time. I’m always around to chat if you ever want to grab coffee! Beautifully written about your dad! He sounds like a great man! Thank you for sharing your story. How strong and brave of you. My heart aches for everything you had to go through! Oh, Merritt. This is so beautifully written and such an honest portrayal of what grief actually looks like. I really appreciate your vulnerability in publishing this and I pray that you continue the healing process. Sending love! Thank you for sharing Merritt. I’m so sorry for your loss. Your dad sounds like an amazing man and his legacy will live on forever. My dad died when I was 20 (also while I was off at college) and I did the same thing. I stayed home for a few days but I had finals and had to get back to my life there (or so I thought) so I just pushed all the feelings down and went about my normal life. I understand why you felt the need to do the same. I’m glad you went and saw a therapist, I never did and I do think it’s something I would’ve benefitted from. It has now been 16 years for me and you’re right, it gets easier every year but never fully goes away. Thank you for opening up like this, I know it had to be very hard to write. Thoughts and prayers with you and your family today. You’re such an inspiration, Merritt. God has allowed you to be a strong rock for your family. Thank you for sharing your story. This post brought me to tears. No one should have to deal with losing a parent that young, but I applaud your bravery in sharing your story for those who are going through something similar. Grief is a tricky thing, but we all experience it at some point in our lives & I think there is so much healing when we can share parts of our journey so others feel less alone in theirs. Praying for you & your family on this difficult day. Merritt, it is so strong of you to share your story. Thank you! I lost my father to cancer when I was 14 after just over a year being diagnosed. You don’t realize the finality of the situation at that age, even though you live through the treatments and his physical changes. Your loss was so sudden and I can’t imagine that, even though I totally identify with your grieving process. Times helps to heal but even after 22 years I still get upset at times. I’m 36 now and pregnant with my first child and I wish he was here for this. So much of how I envision my parenting reminds me of how he was with me. Thank you for your honesty. I too lost my dad young. At 32 in my first pregnancy, which would have been his first grandchild, I suffered some pretty serious prenatal depression and anxiety. Apparently, it is very common for first time moms if they have lost a parent. There are some therapists out there that specialize in this and it was very helpful for me to see one periodically during the second half of my pregnancy and during that “4th trimester.” Good luck! Bless your heart. Having a strong, loving Dad can be one of life’s greatest gifts. My Dad and Mom adopted me at two days old, and I’m so thankful to have been their daughter. I’ve now lost them both and miss them every day. I know your Mom misses your Dad, as well, and I’m glad to see her happy (and with Morris) in your pics. Thank you, Lord, for loving Dads and the legacy they leave us to carry on. Thank you for sharing your story. Your dad sounded like a truely amazing person! I also lost my dad at age 18 in 2005 (his name was actaully Merritt, too!) so i totally understand it gets easier after all the years but never really goes away. What a beautifully written piece. Thank you so much for sharing this with us. Thank you for sharing your story Merritt. I lost my brother three years ago in a freak accident, and sometimes grief can feel so lonely. It’s helpful to read other people’s experiences and know that I’m not the only one going through these emotions, like doing weird things during the shock phase. You’re a strong writer, and I really appreciate when you add in a post like this to your blog every now and then. I’m so sorry for your loss. Thank you for sharing. Grief is not talked about enough in our culture, and I know I felt, at times, that I shouldn’t still be dealing with all those feelings after some years. I, too, lost my larger-than-life father too young. He died from injuries sustained in a car accident when I was 24, he was 53. I literally felt every. single. word. of your story. Going to speak with a therapist was an absolute necessity for me to begin to process what happened. I can’t reccomend it enough. I’m now 35, with 3 beautiful children and every “big” event is especially raw for me without him there, but now I am able to appreciate the many amazing memories that I did get to have with him. I’m 56 years old and cannot imagine life without my parents. You are an amazing woman and your dad would be so very proud of you. I am so sorry for your loss. Your dad truly sounds like an amazing man. Thank you for sharing! I know it can be so crazy to be vulnerable online and appreciate your story. Thank you for talking about counseling as well—it’s such an encouragement to others. Your dad was an amazing man! It was such a devastating time.and everyone misses him. While loved by so many, he absolutely adored his family. He is looking out for you (and very proud!) and always with you in your heart.
. You are the most transparent, honest and relatable blogger i know. So sorry for your loss. You are amazing and living through your dad’s example. Kind regards from Argentina. I’m still weeping while I type this. I’ve no words but know that I’m sending you the biggest, tightest hug. You are so strong and while I don’t know you (in real life although I feel like I do!) I think it would be very hard for him not to be incredibly proud of your success and the amazing person you are! This post had my in tears from beginning to end, happy and sad to read how wonderful he was. I’m so sorry for you loss, thank you for sharing! Merritt, I was at your fathers funeral. I am a friend of your Aunt Genie, and was there to support her. She was devastated by your fathers death. I had lost my son 8 months before this and was still just in a fog of my own. Yes, we all grieve differently, and eventually heal, but we will always have our memories to share. Thank you for sharing. Your story is beautiful and your courage is inspiring. Your dad would be so proud. I’ve never experienced anything even remotely similar to your loss, but still, I know it must’ve been an incredibly difficult post to write. Thank you for sharing. Thank you for sharing this! Too often, we use the internet to showcase only the best parts of our lives. It creates those moments (that I think we have all had) where you’re looking at someone else’s life and thinking, “damn, her life is perfect.” Posts like this remind us that everyone has their struggles and hardships. Your eloquence and honesty on this topic are inspiring and I’m sure will help others in their own journeys with grief. Thank you again and wishing you the best! I remember well when I heard this happened. Your dad would be certainly proud knowing how far you have come! Touching post- your angel is smiling down. Merritt, that is such a nice piece about your dad and your experience during that sad time. He would be very proud of you now, just as he always was. My heart goes out to you, I also lost my father 5 years ago and it seems like yesterday, I also lost my mother 1 year ago, not have them has been very hard to deal with, they were the heart of our family . God bless you ,make your dad proud of who you have become,he is watching over you. I am Shelley Page’s niece. My parents are Lolla and Billy Page. I absolutely love following your blog and often think of your Dad knowing how proud he is of you. His death was devastating to everyone in Austin. What a truly special man & left an amazing legacy. When I see their house in Austin, I always picture it just how it was when they lived there. You are a beautiful girl and so uplifting to follow your blog. I too lost my Dad two years ago from Alzheimer’s. I can relate to all of this. Being a part of those who have lost is something you cant relate to until you are in it. Thinking of you and proud of you!! Merritt, first of all, I’m so very sorry for your loss. There is no appropriate age to say goodbye to a parent, but you were so very young. We are truly thankful to see that you have shared your personal journey with us. No one’s grief is identical to another’s, but sharing it somehow brings us together somehow. I really love what you said about therapy; there is no right time to go, you must decide that you need to speak to someone, but it really helps to have an unbiased person listen to you and help you along. I also did that in a one on one and group setting and I looked forward to those very sad sessions, we need them! I’ve been following your blogs for awhile and as you described your dad, you could have been describing yourself! He’s very proud, that red-haired angel. Wow. That’s a lot for an 18 year old to deal with. Thanks for sharing your experience and I just want to say I have a lot of admiration for you and your blog and Instagram posts. Pure class. Thank you so much for sharing, your story helps me so much. I lost my dad unexpectedly 2 days after my 15th birthday in 2004. I’ve always felt so guilty about how I handled it at the time (shock really does crazy things to your mind- I was in denial for so long). I’m getting married in a month and could use him more than ever right now. I needed to read this, thank you!! Love you Merritt. This was so thoughtful and heartbreaking, but I’m so happy you shared it. Your dad is definitely looking down and is incredibly proud of the amazing woman you’ve become! Sending lots of love! Your story was so sad for me to read. I’m so sad you lost your dad at such an early age. I have lost my parents and a newborn babe. When my mom died, I grieved her but my focus was on making sure my dad was ok. He lived 5 1/2 years after my mom died. Forty years after we lost our daughter at one week old (she was born with a birth defect) our grandson was born on her birthday. Holding him was one of the most bittersweet moments of my life. I was sad for the baby that I never got to hold and joyful for the one that I held on that day forty years later. Grief is a journey one travels alone. Others along the way may support you, but the journey is uniquely yours. Thanks you for sharing. Thank you for your openness and honesty! My father passed away when I was 12 years old and I can identify with SO much of what you said here – especially being excited to see family and friends in the days following and the denial phase being so long for me. I was just so little! My brain couldn’t fathom it. So proud of you for sharing all of this. I know it’s helpful to others! Thanks for sharing your story. And so sorry for your loss. You were so young. October 7th will be three years I lost my mom and best friend unexpectedly. She was 69, I was 50. I can not imagine being as young as you when losing a parent. It must be awful. The pain is different, but still raw. I miss her so,so much. She was everything to me. And I am thankful I had many wonderful years with her. But I still cry for there is a empty whole like the size of the Grand Canyon. I still have my dad,husband and son. Not having the female aspect in my life is so,so different. Guess it’s more the emotional bond than anything. Thanks for sharing your story. Your dad sounded like he was an amazing man. God bless you!! Someone stuck this in my sympathy card they sent me when I lost my mom. Maybe this can help any of you who are greiving. Personally I think it’s a journey we all go threw. And all go threw differently. Here it goes: Laugh when you can, apologize when you should,and let go of what you can’t change. Kiss slowly,forgive quickly,play hard,take chances,give everything,and have no regrets. Life is too short to be anything but HAPPY! Thank you for sharing such a beautiful post. No one is safe from grief forever. We look to those who have suffered grief early in life as a source of strength for when it is our dreaded turn. I know your dad would be proud of the person you have become. You obviously have a kind heart and it sounds like he left a wonderful legacy to follow. No amount of time takes away the pain of losing your Father. I lost mine August 20th 2017. From a massive heart attack he was 68. I’ve been trying to find ways just to cope and that’s been through learning as much as I can about what happeneds after death. I think the younger that you are the more difficult it is. I’m truly sorry about you losing your Dad and how you spent your last moments with him. When I lost my brother 29 days after 9/11/2001 I stood in the hospital room watching the monitor after they had taken him off of a respirator and I watched as his heart beat went from 150 to 0. And I was in complete denial.But with my Dad I got a phone call and I started screaming and crying then going completely numb. Thank you for sharing your story. I’m so sorry for your loss, I’m sure there are high and low days. And I agree that it takes time to heal and even with healing, suffering a loss is something we will never forget. However, I’m so glad you shared your story and process. I’m also confident that your father is extremely proud of you. God bless. I’m so sorry for your loss and what you had to go through at such a young age. Grief is such a tricky thing and is so different for everyone especially timeline. Thank you for sharing such an emotional part of your life with us. I’m so sorry for your loss, Merritt. Thank you for sharing your experiences – I am sure that it will prove to be exactly what someone else who is struggling needs to read. Thinking of you and your family. I lost my mom in 2015 and so much of what you wrote about your dad rings so true about my mom. I could not believe how many people came to same goodbye to her. People I had never met and the stories that they shared. It truly has inspired me to live a life that closely mirrors hers. But it does hurt. Every single day I wish I still had my mom. Oh, bless… Thank you for your vulnerability, Brighton. I can only imagine how many lives your dad touched, as well as how many lives you have touched in sharing your story. Thinking of you and sending prayers your way. What a beautiful, vulnerable post. Thank you for sharing. Lots of love.